In an early step toward letting severely paralyzed people speak with their thoughts, University of Utah researchers translated brain signals into words using two grids of 16 microelectrodes implanted beneath the skull but atop the brain. "We have been able to decode spoken words using only signals from the brain with a device that has promise for long-term use in paralyzed patients who cannot now speak," says Bradley Greger, an assistant professor of bioengineering. Because the method needs much more improvement and involves placing electrodes on the brain, he expects it will be a few years before clinical trials on paralyzed people who cannot speak due to so-called "locked-in syndrome." The Journal of Neural Engineering's September issue is publishing Greger's study showing the feasibility of translating brain signals into computer-spoken words. 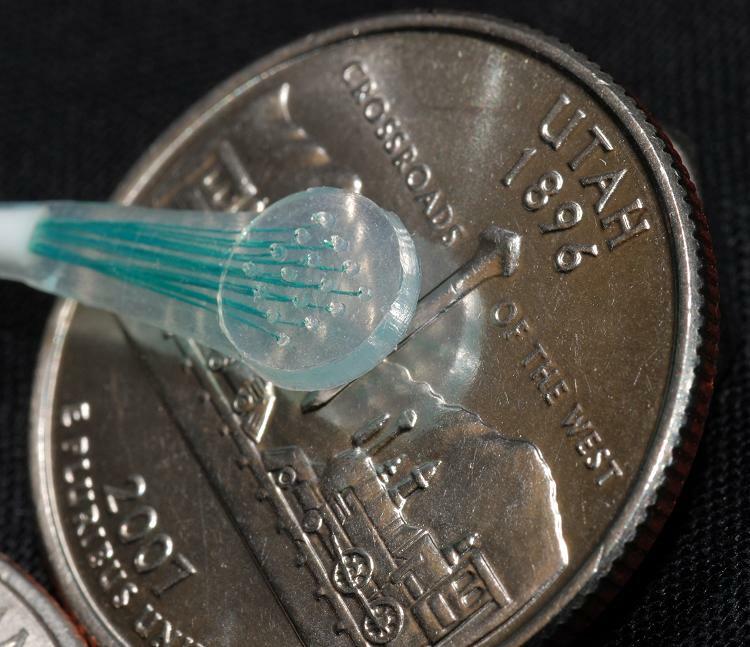 The University of Utah research team placed grids of tiny microelectrodes over speech centers in the brain of a volunteer with severe epileptic seizures. The man already had a craniotomy - temporary partial skull removal - so doctors could place larger, conventional electrodes to locate the source of his seizures and surgically stop them. "This is proof of concept," Greger says, "We've proven these signals can tell you what the person is saying well above chance. But we need to be able to do more words with more accuracy before it is something a patient really might find useful." People who eventually could benefit from a wireless device that converts thoughts into computer-spoken spoken words include those paralyzed by stroke, Lou Gehrig's disease and trauma, Greger says. People who are now "locked in" often communicate with any movement they can make - blinking an eye or moving a hand slightly - to arduously pick letters or words from a list. University of Utah colleagues who conducted the study with Greger included electrical engineers Spencer Kellis, a doctoral student, and Richard Brown, dean of the College of Engineering; and Paul House, an assistant professor of neurosurgery. Another coauthor was Kai Miller, a neuroscientist at the University of Washington in Seattle. The research was funded by the National Institutes of Health, the Defense Advanced Research Projects Agency, the University of Utah Research Foundation and the National Science Foundation. The study used a new kind of nonpenetrating microelectrode that sits on the brain without poking into it. These electrodes are known as microECoGs because they are a small version of the much larger electrodes used for electrocorticography, or ECoG, developed a half century ago. For patients with severe epileptic seizures uncontrolled by medication, surgeons remove part of the skull and place a silicone mat containing ECoG electrodes over the brain for days to weeks while the cranium is held in place but not reattached. The button-sized ECoG electrodes don't penetrate the brain but detect abnormal electrical activity and allow surgeons to locate and remove a small portion of the brain causing the seizures. 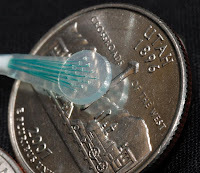 Last year, Greger and colleagues published a study showing the much smaller microECoG electrodes could "read" brain signals controlling arm movements. One of the epileptic patients involved in that study also volunteered for the new study. Because the microelectrodes do not penetrate brain matter, they are considered safe to place on speech areas of the brain - something that cannot be done with penetrating electrodes that have been used in experimental devices to help paralyzed people control a computer cursor or an artificial arm. EEG electrodes used on the skull to record brain waves are too big and record too many brain signals to be used easily for decoding speech signals from paralyzed people. In the new study, the microelectrodes were used to detect weak electrical signals from the brain generated by a few thousand neurons or nerve cells. The study was conducted during one-hour sessions on four consecutive days. Researchers told the epilepsy patient to repeat one of the 10 words each time they pointed at the patient. Brain signals were recorded via the two grids of microelectrodes. Each of the 10 words was repeated from 31 to 96 times, depending on how tired the patient was. Then the researchers "looked for patterns in the brain signals that correspond to the different words" by analyzing changes in strength of different frequencies within each nerve signal, says Greger. The researchers found that each spoken word produced varying brain signals, and thus the pattern of electrodes that most accurately identified each word varied from word to word. They say that supports the theory that closely spaced microelectrodes can capture signals from single, column-shaped processing units of neurons in the brain. The researchers were most accurate - 85 percent - in distinguishing brain signals for one word from those for another when they used signals recorded from the facial motor cortex. They were less accurate - 76 percent - when using signals from Wernicke's area. Combining data from both areas didn't improve accuracy, showing that brain signals from Wernicke's area don't add much to those from the facial motor cortex. "It doesn't mean the problem is completely solved and we can all go home," Greger says. "It means it works, and we now need to refine it so that people with locked-in syndrome could really communicate."